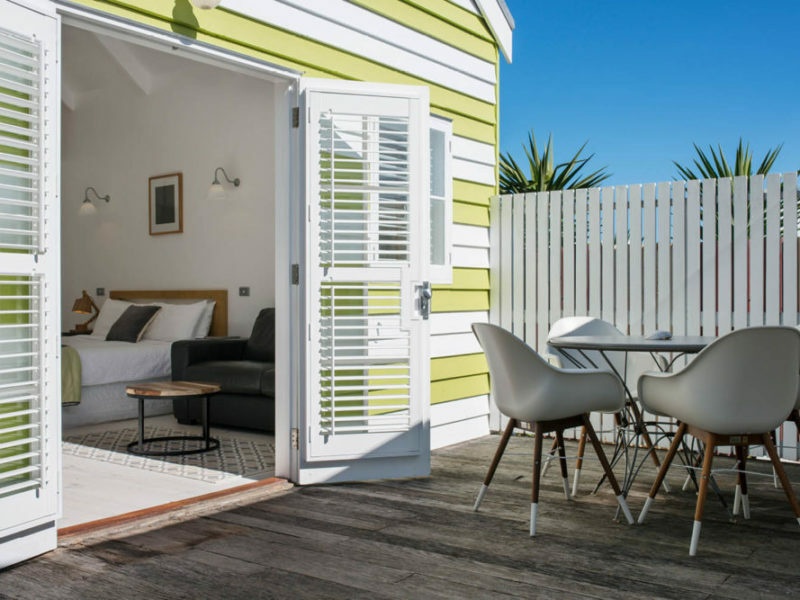 Are these lollipop beach huts the cutest seaside stay in Australia? A hutful of cuteness on the Fleurieu Peninsula (photo: Heidi Who). 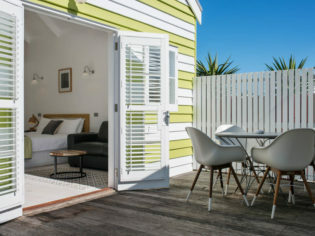 With its lollipop stripes and cosy village vibe, Beach Huts Middleton in South Australia’s Victor Harbour might just be the cutest seaside stay you’ve ever seen. I have driven up and down Victor Harbor searching for beach huts that are not really near the beach several times now, before I finally locate them in a quiet backstreet. Our hastily booked end-of-holiday accommodation choices have been somewhat daggy up to this point, so as I traverse the gravel approach at Beach Huts Middleton, in South Australia’s Fleurieu Peninsula, I am hoping for the best. I’m feeling more confident after entering the reception area, with its curated selection of South Australian wines and stylish interiors pieces for sale. And the nearby restaurant, with its al fresco deck looks good too. We could be onto a winner. Twelve cute lolly-hued beach huts (all paying deference to the most iconic beaches in the country, from Mooloolaba to Portsea to Bondi) are gathered around a lawn and pretty village green, with the Village Hall as its hub. Our hut is the blue-and-white-striped Henley, named after Adelaide’s Henley Beach, which is apt given it was my mother’s childhood home in the 1930s and ’40s. Like its neighbours, the entrance is framed with neat bargeboard and finial, with a welcoming deck and comfortable looking chairs at the ready. Inside, it’s all minimalist beachy chic – rustic wood floors and vintage oars mounted on the walls – with space used to the maximum, while in the neat little kitchenette there’s a bottle of local sparkling (Currency Creek) by way of welcome. The holiday-paced ebb and flow of daily life here revolves around the Village Hall, a cosy communal area where guests come to sit at the large kitchen table, choose beach reads from the bookshelves, and rifle through the cricket bats and tennis rackets. Games of bocce are played between rain showers, with everyone piling back into the hall to play old fashioned board games over a cup of tea until the skies clear. In the morning the noise of the Southern Ocean leads me on a five-minute walk to the windswept beach. I busy myself taking mental note of the extent and variety of local birdlife (I stop counting at 12 species), before wandering back. Day trips are plentiful: to Granite Island near Victor Harbor to catch the horse-drawn tram; shopping the boutiques and galleries of Port Elliot. But ultimately the beach huts are too cute to leave and easy to return to, time and time again I suspect.